You’ve finally achieved one of your greatest dreams in life: the chance to become a mother. You want to memorialize this incredibly special time by taking maternity photos. You just can’t seem up come up with any great maternity picture ideas! Don’t panic. Instead, keep on reading in order to get the inspiration that you need. In this post, we’ll tell you how to make the most of your pregnancy photo shoot. From couples pregnancy photos to stunning solo shots, we’ll go over some of our best maternity photo shoot ideas. One of our favorite maternity picture ideas? Don’t just include your partner in your photo. Also include your parents, and the parents of the father. Not only will this make them feel incredibly special, it’s also a wonderful way to take your first ever “three generations” photoshoot. You should stand in the front of the frame, cradling your baby bump in your hands. Then, ask the baby’s father to stand behind you, while your parents and his own stand behind all of you. The result is a truly heartwarming picture that you can show your child once they arrive. It will remind them just how much they are cared for, and about the bonds of your family. Another awesome idea for your shoot? Find a piece of clothing that shows off your belly, and then hire a local artist to use some body paint to create a beautiful design. We think that pastel shades and wavy lines work best here. To really take things to the next level, toss on a flower crown to get in touch with your inner earth mother. Of course, you could also write a funny or special message to your baby on your stomach. Maybe this isn’t the first time that you’ve added to your family. If so, then we know that your children are likely very excited — and possibly a little bit nervous — about the arrival of a new baby brother or sister. One way you can make all the children in your family feel included? By making them a part of your maternity photo shoot. Being a new parent can be seriously hard work! One of the things that we know you’ll miss the most? Pose for a hilarious maternity shoot with your partner by sleeping back to back while sitting on the ground. Or, simply lay down on your own and pretend to be snoring. You’ll look back at these pictures longingly once your new baby arrives! Another way to show those who see your maternity photos that your super excited for your new arrival? Have your portraits taken in the nursery itself! You can make the stuffed animals, baby blankets, and even the crib a part of the shoot. Once you’ve finished, be sure to have the picture framed and placed in the nursery. This way, your baby will know for sure just how excited you were about their life before they were even born. It’s a wonderful way to bond with your child, and to show off just how hard you’ve both worked on creating the perfect nursery. We know you can’t wait to show it off! Your wedding was the most special day in your life — that is, until you found out that you were expecting. Why not combine these two incredibly special and important occasions and pose with your wedding veil in your maternity photos? This will help you and your husband to remember the special bond that you share. When you’re browsing through Pinterest and looking for maternity photo ideas, we’re pretty sure that you’ve seen countless shoots that look exactly the same. They’re all on top of a mountain, in a park, or in front of a rainbow after a storm. And while these ideas can certainly produce beautiful pictures, there’s nothing unique about them. There’s also no personal connection to the parents-to-be. Instead of focusing on the backdrop and setting that will get you the most likes on Instagram, choose a place that’s actually special to you as an individual couple. It’s OK — even preferable — to keep it silly! Maybe you want to have your shoot in front of the movie theatre where your baby’s father cried through an entire chick flick. Maybe you and your partner are huge baseball fans, and you want to do a shoot in the stands while you’re cheering on your team. Perhaps you even want to keep it more sentimental, and pose in front of your home, in your baby’s nursery-to-be, or at the place where you had your first date. Just make sure your maternity photo shoot is about you, not what everyone else is doing. As a parent, we know that you’ll be spending the rest of your life teaching your child lessons. Sometimes, these lessons can be simple. This means things like how to tie a shoe or make up a bed. Other times, these can be essential and moving life lessons — like how to treat others or stand up for what is right. On your pregnancy photo shoot, get a chalkboard or write up a special message to your child ahead of time. This message should be the most important lesson that you want to teach your child. It can be a quote from a favorite novel or holy book. It can even just be something small that you want your baby to remember forever. This will create a stunning picture that both you and your child can look at for years to come. It will also always help them to remember what really matters in life. You can also make it clear what you want them to take from their time with you. So far in this post, we’ve mostly discussed our ideas for couples pregnancy photos. However, it’s also important to remember that your maternity photo shoot is mostly about you. Think of it as an opportunity to take your first ever “Mommy and Me” photo! We understand that, when you’re pregnant, it can sometimes be a bit of a challenge to love the way you look. Your clothes don’t fit you well, you’re dealing with swelling, and you’re carrying around lots of extra weight. 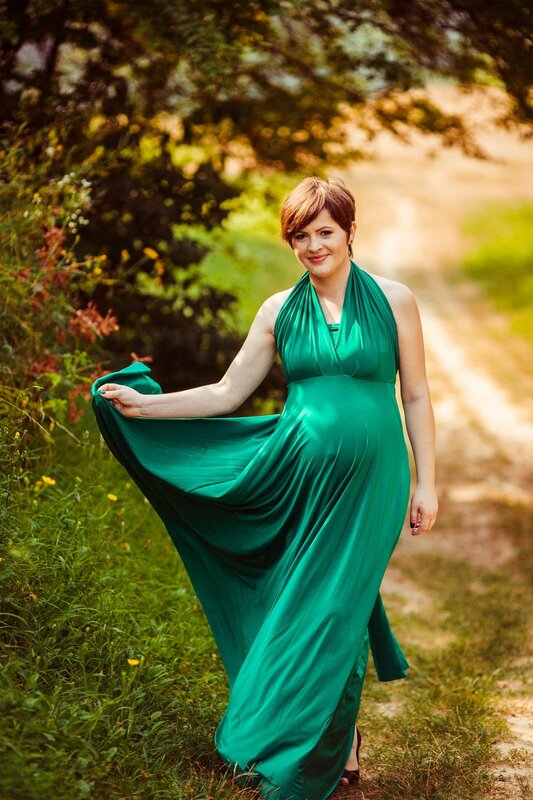 Your maternity pictures should be a time for you to feel both beautiful and glamourous. In other words, don’t be afraid to go over-the-top when it comes to your hair and makeup. Put on large statement earrings, wear a beautiful long gown, and have your makeup professionally done for the photoshoot. You deserve to feel as stunning as you are. Plus, remember that you’re never going to have the opportunity to take these photos again. Even if you don’t want to take them in the moment, down the road, we know that you’ll be glad that you did. Your maternity pictures will help you to create lasting memories that highlight the sacred act of motherhood. Above all, remember that your maternity shoot is about you. This means that you should make it as unique to your family as is possible. Are you obsessed with a certain television show? Can’t get enough of a music star? Want to pose with a flag to show off your love for your country? Out final tip for nailing the maternity shoot is to find props and styles that resonate with you. More than anything else, relax and have fun! Ready to Schedule Your Maternity Photo Shoot? From a three generations photo to a mommy and me glamour shot, we hope this post has you excited about your maternity photo shoot. Remember that your maternity photos are a once-in-a-lifetime opportunity. This means that it’s never too early to start coming up with maternity photo ideas. Be sure to include not only yourself and your partner, but also the other important people in your life. Of course, it’s the quality of the photographer themselves that makes all the difference. Spend some time on our website to learn more about us, and get in touch to schedule your shoot.